As the Tempest, Irene, rages outdoors, lashing us with wind and water, I sit here clearing the fog in my head with a hot teapot of English B this Sunday morning, hoping that my electricity and therefore my internet access will not abate. It also brings to mind the relationship between water and wine. From the events described by St. John at the Wedding at Canaan, to the actual mixing at table of wine and water as Thomas Jefferson seems to have done with what he described as vin ordinaire (say it ain’t so, T-Jef! ), to the bigger no-no of putting ice cubes in wine, I didn’t think there was much more to say about this subject. The Bisson “Abissi” 2009 vintage was pulled from the depths in July and hopefully might be available in the US sometime this fall. Maybe this is just a gimmick to sell wine, but count me in. Not to split hairs, but John the Evangelist tells of the Lord’s first sign at a wedding feast in Cana – a village in or near Galillee. Canaan was more Old Testament – Hebrew Scripture, probably somewhere in or near Mesopotamia. Great story of the Lord making very extraordinary wine from very ordinary water in very ordinary stone jars … and about 150 gallons of it! The takeaway? The Lord can do extraordinary things in our very ordinary lives when he is invited! Point taken on the Cana/Canaan thing. But you are aware that this is a wine & food blog and the catechism class is across the hall, in the room overlooking the parking lot, right? 150 Gallons? I’m sure you’ll tell me next that not one person suffered from a hangover. Now THAT would be miraculous. Does this mean I don’t get to go to heaven? DD, must have been the best wine ever! Bisson wines are anything but vin ordinaire. What can I say – I am a sucker for Ligurian wines. I had Bisson’s Marea at a NYC restaurant back in February, and it was like drinking the Sea itself (in the best possible way, not the gross dirty sea water you would splash in) . When I wrote this back in August of last year, I was looking forward to tasting this. I still have not done that! So I really love your Abissi tasting note. Now you have motivated me to look for this when I return home from my current trip. As for splashing about in gross dirty sea water— what beaches do you go to? First of all, you have to understand that I am an Earth sign, and am not big on beaches in general. The gross dirty sea water is probably a vestigial memory from going to Galveston, Port Aransas, etc when I was living in Texas a while back. Now, as far as wine is concerned, sea notes is one of my favorite things (both live sea, such as in Ligurian and Spanish coastal whites, and dead sea, such as in crus Chablis). I understand– another reason to fear/suspect Texas? Hello! 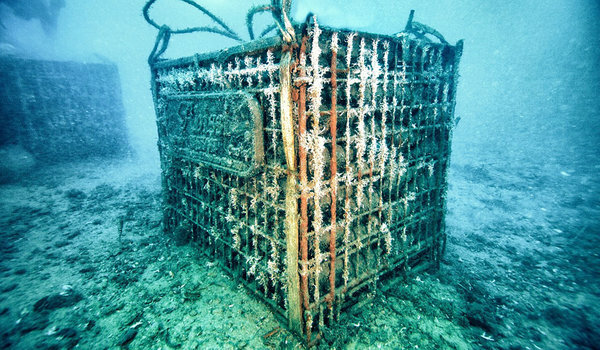 I also took interest in Piero Lugano’s peculiar way to store his wines…but I wondered if he had TASTED his wines underwater. Using your tongue to pierce a plastic wrap membrane– a Brilliant and Sensual solution! Not being a scuba-guy, I will have to try this in the bath tonight! But it seems it would be better if you have your best girl in the tub with you, don’t you think? Many things underwater are more sensual! And it was the quick dart of my tongue, like that of a hummingbird, that allowed me to drink wine at these murky depths. Thanks for visiting the Sybarite Zone.